Hi everyone it's Friday Doodle Day yay! It's my turn to set the challenge this week but before I get started this is a last last call for the Aquamarker competition! If you have been asleep for the past 6 weeks you might not have noticed that we have a great competition for you to enter. All you have to do is show us a project which includes your own colouring techniques. 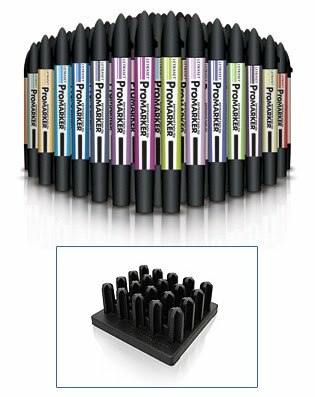 Now this can be watercolours, Promarkers, pastels, chalks, inks whatever you want to use, and you don't have to be Rembrandt for a chance to win either! 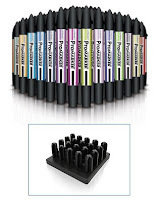 The winning entry will be judged on a number of different criteria and as I'm Head Judge I will be picking the one I like the best and who I think will be very appreciative and deserving of the lushy pens! 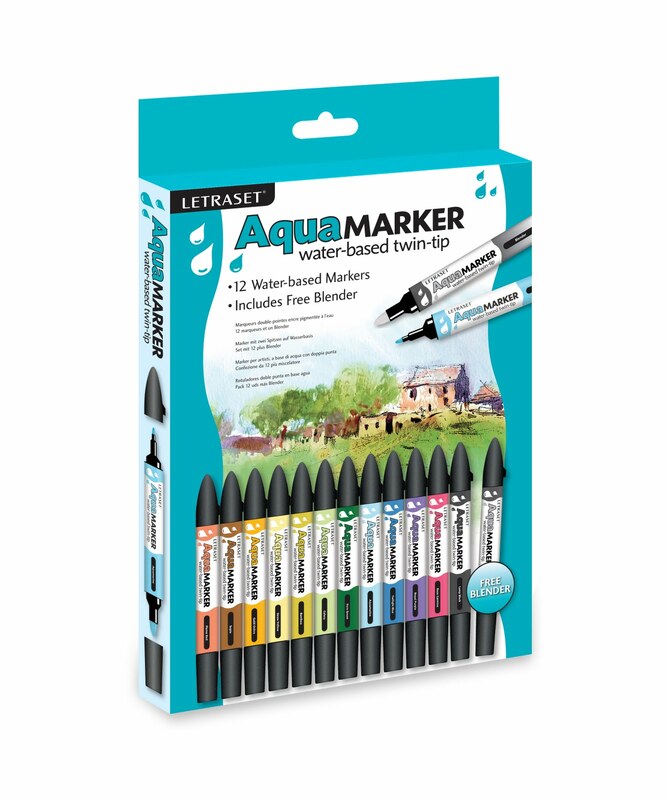 The lucky lucky winner will receive a full set of Aquamarkers from Letraset worth £79.99! BUT we also have some smaller sets to give away too, so you have more than one chance of getting your hands on some lush stash. You can enter until 12:00GMT on Tues 31st August - make sure you leave a link to your entry in the comments section below this or any of the other competition posts - do NOT leave an entry in the InLinkz please. Now, as the lovely peeps at Letraset have sponsored this comp they asked me if I would do tutorials every week so this, my lovelies is the last in the series, I hope you enjoy it. Now I've got to grips with loading my tutes online I will deffo be giving you more in the future. Right, let's get one with this week's doodley biz! Please remember that the maximum number of challenge you can combine this one with is 10 (including Polkadoodles) and that the deadline for entries via the blue frog below is Sunday 5 September at 12noon GMT. Good luck! Lou: Firstly must say that I have rotated the sketch 90 degrees! I have used the yummy new cupcake stamp stamping it 3 times, using my Promarkers to colour. Paper is from the "All around and everywhere" CD. Nikky also only wanted us to use 3 colours: mine are orange, pink & brown . . . OK there is white but I had to stamp onto it (!) and the cherries HAD to be red (!) 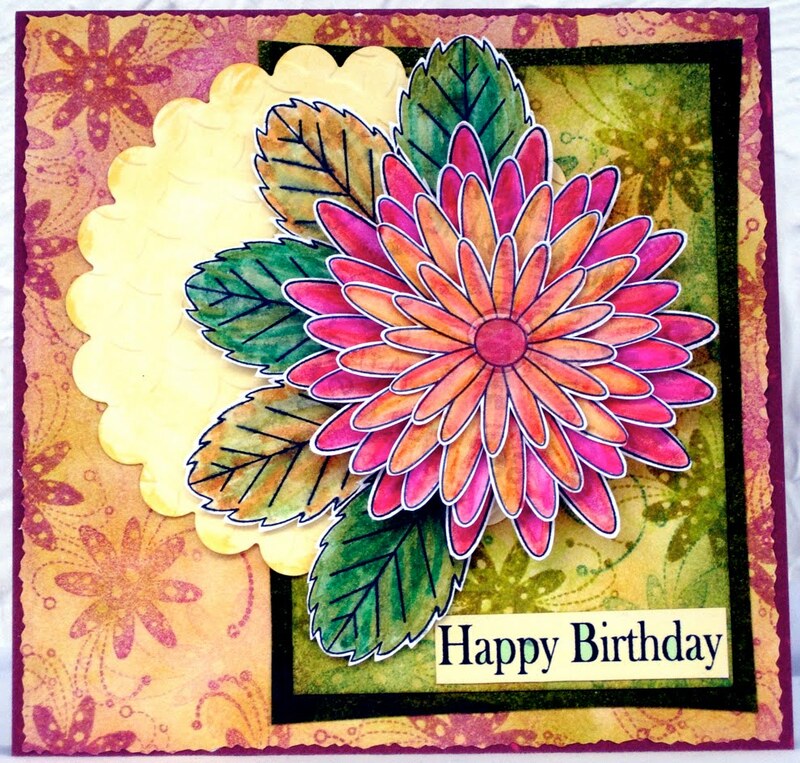 This card was made for Claire (Hope Jacare) who had a significant "aged" birthday on Monday!! Can you guess how old she was? Brenda - Papers and poinsettias are from the new Christmas Paper Boutique CD, decouaged and layered onto mats cut with Nesties. A Martha Stewart snowflake border punch and ribbon to finish. 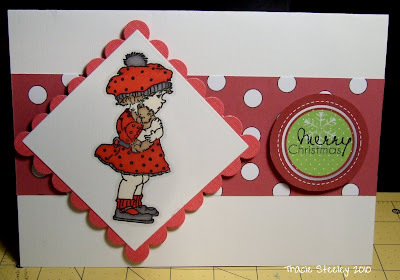 Greeting on the tag is from the Jingle Jangle Christmas stamp set. Kris: I also rotated the sketch 90 degrees - made more sense to me - go figure! My 3 colors are taupe, copper, and blue (hope the ivory doesn't count - ha ha). All of my papers and the flowers are from the Sugar Birdies CD and the sentiment is from All Around & Everywhere. I also used a Martha Stewart double scallop border punch, a nifty notch tool I have (that I always forget about), and some matching rhinestones. Tracy - I have rotated the sketch too, and everything I have used is from Paper Boutique 1 CD Rom. I have used nestie circles instead of squares, they seem to go better with my ladybirds. My three colours are - red, green and pink. Dee: I wanted to make a nice bright card this week as it's been so dull and gloomy. I took my 3 colours orange, green and blue from the stripey backing paper. I used the Butterfly House stamp from the Stamp Doodle's collection and coloured them in with AquaMarkers. The papers are from the Sugar Birdies and Candy Doodles cd's. Fliss: I decided to make an early Christmas card to add to my collection so I don't panic in December. I used backing papers from the Jingle Jangles CD, my chosen 3 colours being red, green and gold. I made a border for the green harlequin panel with gold card. I stamped the cute angel in a stocking from the Polka Doodles stamp range in black, coloured her with Promarkers and cut her out. I finished off with some small holly sprays from the Paper Boutique 2 Creative Christmas CD and a greeting from the Xmas Doodles stamp set coloured with Promarkers. Tracie: I used the gorgeous Fairy Flutterby stamps and a couple of snow flakes from the Christmas Doodles set to make my icy card. 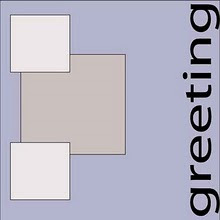 The Greeting was computer generated and the whole lot promarkered. My colours were Blues, White and Brown (hair) and lots and lots and lots of Glitter!! Ruth: I swear I did not see Brenda's card before I made mine! I've used the Ponisettias from Creative Christmas and layered them up. The backing paper is also from the same cd and I've simply inked the edges. I really chickened out and used ribbon in place of the sentiment, mainly because my card base was too small and I'd left it all to the last minute! I've added gems to the centres and if you look closely you'll see the glue as it wasn't dried before I took the photo! Stacey: I just cannot seem to shake this festive feeling, I have reached for Jingle Jangles once again with soooo many fab images such as these super cute penguins who can blame me??? Good luck in entering - the deadline is Sunday 5 September at 12noon GMT. Hello everyone, Fliss here and it's my turn to set the challenge theme this week. Make sure you check out this week's tutorial - Nikky's using the awesome Aquamarkers again to give you some ideas! amazing if you love watercolour techniques. We also have some additional runner up prizes of smaller packs too and all you have to do to enter is to do some colouring! It can be any kind of colouring, watercolours, promarkers, copics, pencils, pastels, whatever's your bag, we just want to see your lovely work. And once again, we have to reiterate that you do NOT have to be Van Gogh to win either, all entries will be judged on various criteria so even if you think you're not a great colourist, still enter, you never know, we might think you deserve to win a set of Aquamarkers for your troubles! Here's this week's tutorial, get your cup of coffee and a bar of chocolate now...with the wonders of technology Nikky has managed to film this in double vision (think she was trying to go for 3D TV LOL) so apologies but it's still a great tutorial! 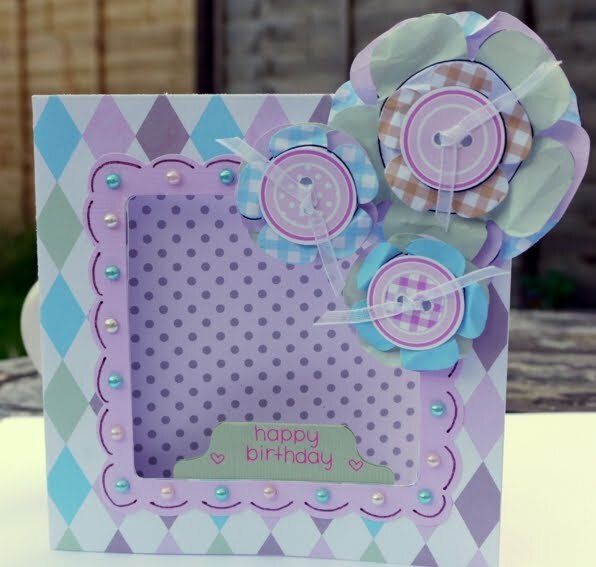 Nikky will be on Create and Craft on Sunday 22nd August at 10am showing some great products as usual so make sure you don't miss her - those of you who can't get C and C on your TV (Sky 671) you can watch online on the Create and Craft website too! Right, let's get on with this week's challenge but before I tell you all about it, it's on to the results from the sketch challenge. And now for this week's challenge which I picked as I thought we ought to show all you vintage fans out there (of which I am one!) 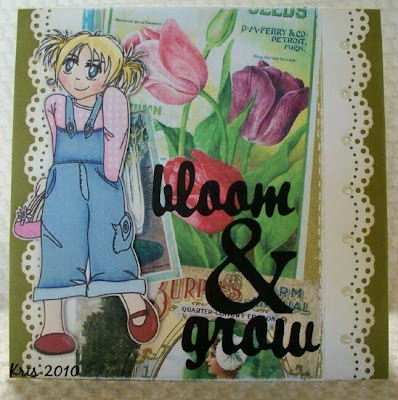 that you can go Vintage Style with Polka Doodles too, using the fabulous CDs or the gorgeous stamps on offer. So your challenge is to come up with a gorgeous vintage creation too. Here's some very inspirating creations from the Design Team to get you thinking. 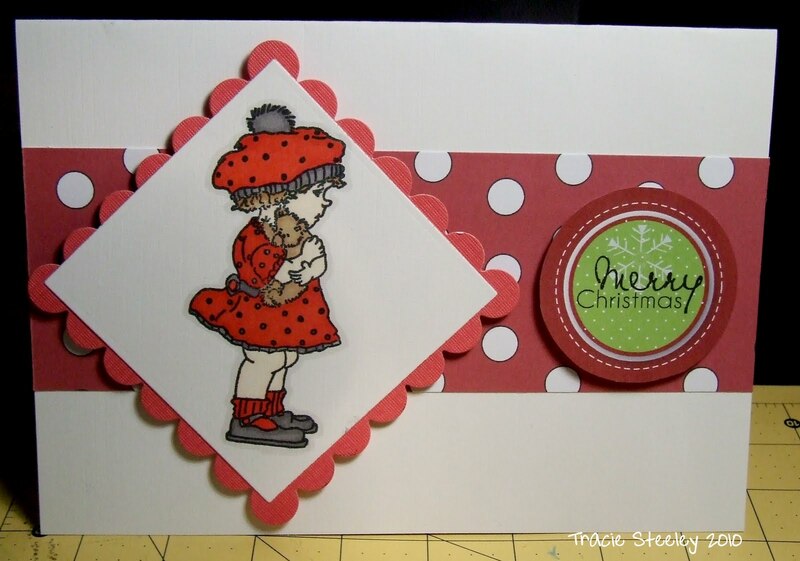 Ruth: I've used two of the new Stamp Doodles - the shabby prim Angel in a stocking and also the bow with holly. Both have been coloured with Promarkers plus a tiny bit of glitter glue on the stocking. All the papers are from Not For Girls cd with a bit of doodling around the edges and some buttons. Kris: I wasn't sure what I was going to do when I first saw this challenge but I rather like how this one turned out. I used a plain olive green card for the base and then the Seed Packet collage from the Not for Girls CD. It printed rather bright so I sanded it to dull it down. I added some Martha Stewart punched borders, the girl stampie from Back to Nature, a die-cut sentiment and some self-adhesive pearls. I think she looks just like she stepped out of the farmer's market! Fliss As this is my turn for the challenge, I challenged myself to go very vintage. I made background papers with the flower flourish stamp from the Daisy Doodles stamp set and Distress inks, full details of how I made this are on my blog. I printed out the stacking flowers and some leaves from the Love and Cherish CD on the Housey Housey text paper from the Back To Nature CD. I then coloured these with Aquamarkers and a damp brush to blend the colours. I added a scalloped and embossed circle also coloured with Aquamarkers for contrast. Lou: I have used one of the FAB NEW stamps released at Doncaster. They are dream to colour and I have used my promarkers. Although she is a Christmas Angel, I thought it would be nice to use her for a different theme . . crafters prerogative, I say! Lots of matting & layering and a bit of nifty recycling . . the corrugated card and the lace edging . 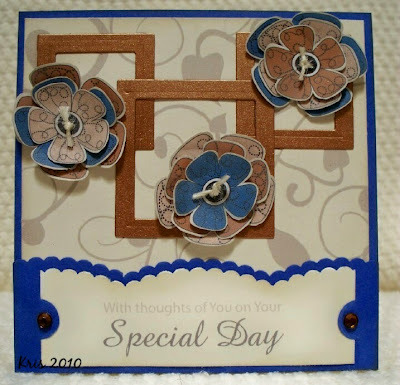 . . a really quick and vintage feel card ! Jenny My card uses the beautiful rose paper from Love and Cherish. I stamped the little butterfly stamp from the 'Babsie' Fairy Flutterfly set onto the back of some gold card, cut them out and folded their wings forward. 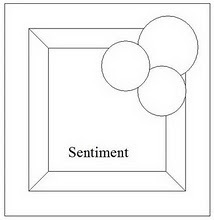 The sentiment comes from the Back to Nature CD. Claire I decided to go for some imagery from the All around and Everywhere Cd. I coloured the deer using aquamarkers and added a little grungeboard swirl, some inking and faux stitching. 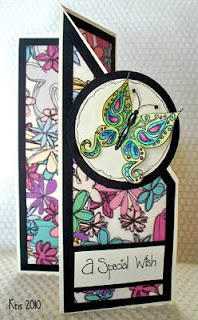 My overall card was inspired by Wendy Vecchi as I am not that familiar with vintage I went for a little trip round blogland - great place for inspiration! My papers are also from the All Around and everywhere Cd. Tracy - For my creation I have used for the papers and the flowers, the All Around And Everywhere CD, and for my image I used the NEW Stamp doodles stamp, the cake stand which I then coloured with Aquamarkers. I distressed all my edges with Stormy Sky Distress Inks and added some stickles. Brenda I don't know why, but Christmas door wreaths always make me think Victorian, so this was an obvious choice for me using one of the the new Christmas Doodle stamps along with Paper from Christmas Paper Boutique CD. The easel card was made using a Marianne circle stencil cut through the Big Shot. Dee: I've used the Not for Girls cd for my card. I think it's the first time I've used it for a challenge, and as it has images and papers on it that are just perfect for a vintage feel it was the obvious choice for me. All the paper elements on the card are from the cd which I have distressed and inked with Old Paper and Wild Honey Distress Inkpads. I added a few touches with a gold ProMarker, a couple of metal embellishments, brads and natural string to finish it off. Lisa - I used the Love and Cherish CD for my card. I just love the heart background and all the heart clipart. I embellished with some glittery hearts and some shabby seam binding and finished with some yummy Prima flowers! Please remember that the maximum number of challenges you can enter including this Polkadoodle challenge is 10, and the closing date is Sunday 29 August at 12noon GMT. Good luck and please link up your creation with the widget below. Phewee, yet another tutorial from Nikky this week - make sure you check it out! amazing if you love watercolour techniques - make sure you check out Nikky's tutorials which showed you the great effects you can achieve with these if you missed them previously. We also have some additional runner up prizes of smaller packs too and all you have to do to enter is to do some colouring! It can be any kind of colouring, watercolours, promarkers, copics, pencils, pastels, whatever's your bag, we just want to see your lovely work. 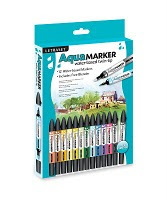 And once again, we have to reiterate that you do NOT have to be Van Gogh to win either, all entries will be judged on various criteria so even if you think you're not a great colourist, still enter, you never know, we might think you deserve to win a set of Aquamarkers for your troubles! ...Hello it's Stacey here!!! This is my very first time to set a challenge for the team, I am a little nervous but here goes. . .
Congratulations to you all, great entries as always! Please contact Nikky for blinkies etc. Now, onto this weeks challenge...This week I asked the ladies to print or stamp onto vellum or acetate. I thought this was a good idea until I realised that my printer does not like acetate!!! My problems aside, the team as usual have produced a wonderful selection for you to feast your eyes on! I cannot wait to see what you guys come up with! Stacey - As I have already said my printer was not getting on with acetate argh!!! So I had to rummage through my stash for some vellum. I had a pearl vellum pack hiding in the depths and when I printed the papers from the Jingle Jangle CD It made the papers look even more amazing as they have a pearl sheen to them. It is hard to tell from the pic but the border and background papers have a real sparkle! I added micro glue dots sheet which was fab and does not show through the printed vellum!!! I added beads to the highlights on the polar bear and glossy accents to his nose!!! Enfys - I printed out the peacock toppers from Back to Nature onto white vellum, then used spray mount adhesive to stick them onto a very pale lilac paper. In real life the effect is lovely, the image has a soft transluscent look. Ruth: Now I made not one but two cards! Only because the papers and flowers that I had printed were sufficient to make two and I just have to use the vellum flowers as they are so pretty! I've used Sugar Birdies cd for the papers - printed both sheets to fit onto one A4 and also did the same with the vellum flowers so that they are small enough for the A6 sized cards. I've handwritten the sentiments and added some doodling along with seed beads for the flower centres. Jenny This box frame is so much simpler than it looks... I just added some rose paper from the Love and Cherish CD. Then printed a heart image onto acetate which I made into a little box lid which sits inside the frame so the acetate image stands out. Fliss - I decided to go for vellum for a soft look and printed out the pretty daisy paper from the Love and Cherish CD on to pale yellow vellum. I put this on a background of cream card edged with my deckle scissors. I made a border with a Martha Stewart punch and a strip embossed with a daisy folder. I printed out the butterfly from All Around and Everywhere on mint card and blue vellum, cut them out and layered them together with pearls as the body. Brenda I used the Paper Boutique CD, re-sized the flowers and printed onto acetate, which I them matted onto white cardstock and fixed with brads. I printed more of the same flowers onto white cardstock, cut out and glittered the edges. The swirly leaf is cut from a sizzix die and the card edging Martha Steward embossed scallop. Kris: I mader a concertina card. I printed one of the Blossom Exposion papers from Back to Nature onto plain vellum. Then cut panels and framed them with black card to give them a stained-glass effect when mounted onto ivory card. 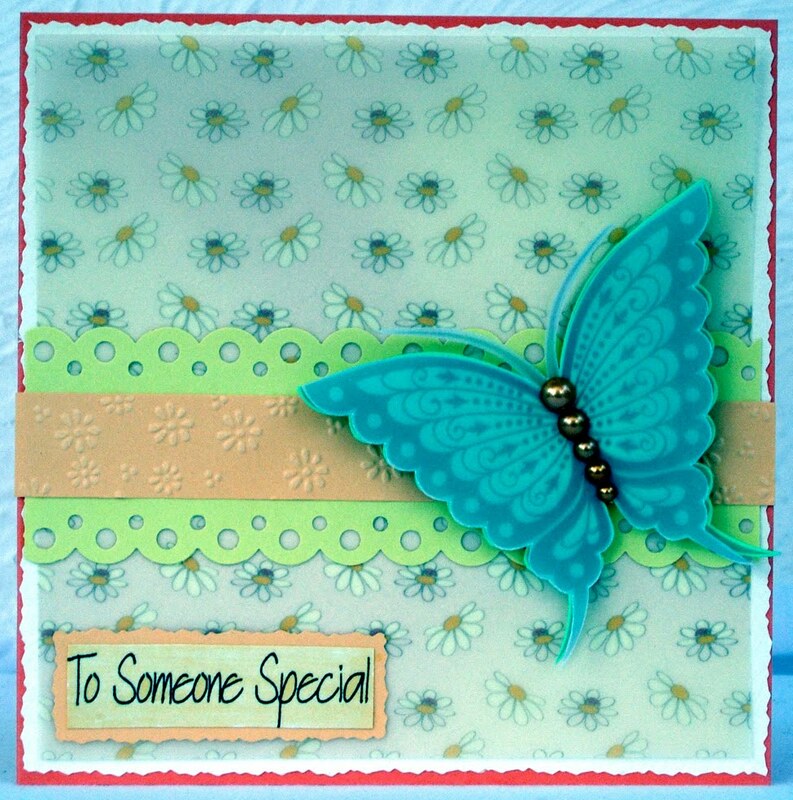 The butterfly and sentiment are from the Fairy Flutterfly set - Bevvieboo. I colored the butterfly with Letraset Aquamarkers and then highlighted with Promarkers, glitter glue and some Glossy Accents on the body. Claire I decided to go for some soft yet fun Vellum flowers and butterfly to compliment my house which I have water coloured with Aquamarkers. All the elements are from the All Around and Everywhere CD. Tracy - For my creation I used the Candy Doodles CD and printed the candy boys backing paper on to white vellum. I then printed and re-sized the stampies to match and coloured them with Promarkers. My main image was coloured with the fab Aquamarkers. Lisa - I made an easel card this week and I used the Candy Doodles CD. I printed Little Miss Polly Polkadoodle out onto vellum paper and cut her out. She would be cute no matter what you printed her on but the vellum gives her a very soft feel! I also used the adorable flowers from the All Around and Everywhere CD to showcase Miss Polly and I think she looks great! Gotta hand it to that Nikky, she sure can draw! Good luck! Please link your creation with the widget below - deadline is Sunday 22 August at 12noon GMT and please remember our 10 creation challenge rule! Hello Doodlers!The weeks just fly by dont they! you deserve to win a set of Aquamarkers for your troubles! Ok, on with this week's challenge and last week's winners! Well done everyone and please contact Nikky for your blinkies! It's been a while since we had a sketch challenge so your mission this week, if you choose to accept it, is to create a project using the following fabulous sketch designed by Kerry. Brenda I have twisted Kerry's sketch a bit as Rudolph turned out a bit larger than I expected. All the elements are from Paper Boutique Christmas, Rudolph has been decoupaged, his hat is glittered and the snowflakes made using a Martha Stewart punch. The NOEL sentiment is from the same CD. Lou: I have also flipped the sketch 180' and all the elements on my card are from the "Not for Girls" CD. I am soooo in love with this Jazz Player image and want it as a huge poster on my wall ! I printed a couple of the images, using one as my base image and then cropped the other images to layer bits of on top; this was to give an aged effect . . or for something different ! Nettie: I loved making this one and following the sketch. I have gone for a Shabby Chic kind of look with this one. I have created an aperture with this card and added some little pearls around the frame. I have used papers and flowers from the All Around and Everywhere CD. So girly!!! Lisa - I enjoyed following the sketch very much and I chose to use background papers and flowers from the All Around and Everywhere CD. I just love the dainty little butterfly added on to the sentiment. I just couldn't get the colors of the card to photograph well indoors but outdoors on a plant, the card just came to life! What a sunny day for a sunny card! Tracy - For my creation I have followed the sketch by using papers from the All Around and Everywhere CD, the flowers were done by using Back to Nature cd and the treat bag was also using the All Around and Everywhere CD. Fliss - I've made a new home card with the lovely house stampie from the Back To Nature CD which I resized slightly and printed out on watercolour paper. I coloured the image with my watercolour pencils and mounted the panel on blue paper. I added a mat of textured paper from the Not For Girls CD with faux stitching to make it look like the sketch. I used background paper from the All Around and Everywhere CD and flowers from the Sugar Birdies CD. Ruth: I've used the Gracie Fairy Flutterfly stamp, which has been coloured with Promarkers, along with the sentiment stamp from the same pack. The image has been layered onto papers printed from Candy Doodles cd. Candy Doodles is probably one of my favourite Polkadoodle cd's and its also great for soft baby colours too! I've made the flowers by cutting out circles of card, snipping the edges and curling them inwards and then layered different sizes ontop. Really easy and quick! Kris: Nikky has certainly got me in a Christmas card mood! I decided to take the sketch and rotate it 180 degrees. I made a 'frame' card that gives an extra bit of dimension with a few little cuts and folds. 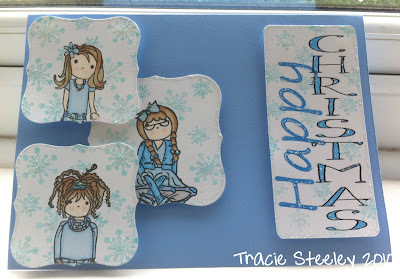 The papers and sentiment are from Creative Christmas and the ponisettia is one of the new Doodle Stamps. The stamp is very versitle and it's quite large with four layers of petals. Colored and cut only three of the layers for the larger image and just two for the smaller. Colored with Prismas and OMS for the flower petals and a gold Promarker for the centres. Jenny This was such a lovely sketch to follow. My card uses one of the new Stamp Doodles. I have coloured the birdcage image with watercolour paints to match the patterned paper from All Around and Everywhere that I have mounted into little silver frames. I've added some yellow watercolouring to the patterned paper just to make the colour match perfectly. 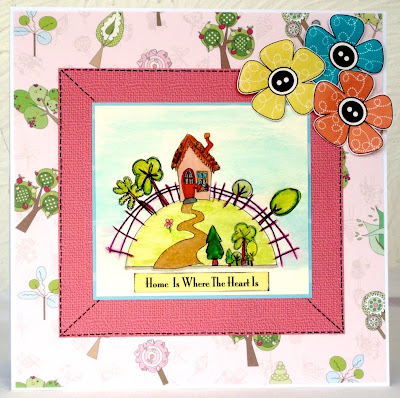 The sentiment stamp is from the 'Babsie' Fairy Flutterfly stamp set. Claire - I have used one of the fab images of a cup of hot chocolate from the new Christmas CD - Paper Boutique II - Creative Christmas along with some poinsettia from the same cd. I have water coloured the images, it was great fun to do and I loved this sketch - definitely one to work with again! Tracie: I used a couple of backing papers and a sentiment from Paper Boutique Vol 2: Creative Christmas as well as the Poinsetta template in A6 size which I cut from felt. I also used one of the gorgeous new Stamp Doodles. 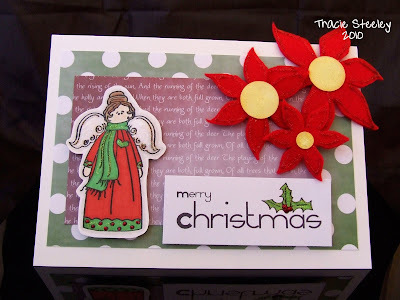 Dee: I used the Christmas Doodles rubber stamp plate and backing papers from the Jingle Jangles cd for my card this week. I've made the card A4 size, mainly to show that you don't have to have a large image just because you have a large card. I used the lush Aquamarkers directly onto the stamps then bled the colours out with a damp paintbrush. I added some ribbon, brads and stickles for the finishing touches. Good luck in entering and please remember, the maximum number of challenges you can enter to be in with a shout of a top three placing is 10 - this includes the Polkadoodle challenge. You have until 12noon GMT on Sunday 15 August to enter and please use the widget below to link up your creation.